This ingredient intensive recipe that he made on Top Chef Masters is one of his signature culinary creations. Over 20 ingredients comprise this sauce that contributed to him winning the title of Top Chef Master this season. De-stem and seed the chiles and collect the seeds as you go. Scoop seeds into an ungreased medium sized skillet along the torn-up tortilla, set over medium heat, turn on an exhaust fan, open a window and toast your seeds and tortilla, shaking the pan regularly, until Burned to charcoal black, about 15 minutes. Then scrape into fine mesh strainer and rinse for 30 seconds, transfer to blender. Set ungreased skillet over medium heat, lay on piece of aluminum foil and lay onion slices and garlic cloves. Roast until soft and very dark (5 minutes each side for onion, 15 minutes for garlic - turn frequently as it roasts). Cool garlic a bit, peel it, combine with onion in large bowl. Pre-Heat oven to 350 degrees. Return skillet to medium heat, add 2 cups of lard or oil (1/2 inch depth) and begin frying chiles. Fry for about 30 seconds until crisp when cool but not burnt. Drain well, gather into large bowl, cover with tap water and let re-hydrate for 30 mins, stirring for even soaking. Drain reserving the soaking liquid. While chiles are soaking, toast seeds and nuts on baking sheet in oven (sesame seeds on one, and pecans, peanuts and almonds on the other) - about 12 minutes for sesame seeds, a little longer for other nuts. Add to blender along with 1 1/2 cups of chicken broth and blend to puree. Transfer to small bowl. Without rinsing blender, combine green tomatoes and tomatillos with another 1/2 cup of chicken broth and puree. Pour into another bowl. Without rinsing the blender, combine onion and garlic with bread, cloves, black pepper, cinnamon, oregano, thyme, banana and 3/4 cup of broth. Blend to smooth puree, then pour into another bowl. Repeat with remaining chiles and another 1/2 cup of chicken broth. In a large 8-9 quart pot (preferably Dutch oven or Mexican cazuela), heat 3 tablespoons of oil (what you used for chiles) and set over medium heat. When very hot, add tomato puree and stir and scrape for 15-20 mins until reduced, thick as tomato paste, and very dark. Add nut puree and continue stirring and scraping until reduced (thick and dark), about 8 minutes. Then add banana-spice puree, stir/scrape for another 8 minutes. Add chile puree, stir well, reduce over medium low heat until very thick and black ~ 30 mins, stirring regularly. Stir in remaining 7 cups of chicken broth, the chocolate and avocado leaves, partially cover and simmer gently for 1 hour. Season with salt and sugar. Remove avocado leaves. In batches, in a loosely covered blender, puree sauce until as smooth as possible, then pass through a medium-mesh strainer into a large bowl. Return mole to the same pot and heat it to simmer. 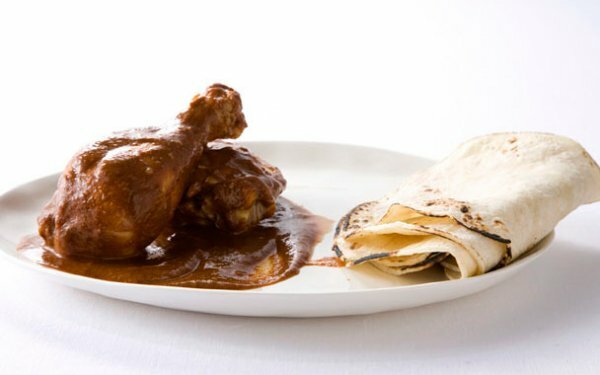 Place leg and thigh quarters of the chicken into the simmering mole, partially cover and cook for 15 mins, then nestle in the breast quarters, partially cover and simmer for 20-25 minutes, until chicken is done. Remove chicken pieces from mole, transfer to warm platter, spoon mole over and around them, sprinkle with the reserved sesame seeds and serve.